Who doesn’t love a new pair of shoes right? 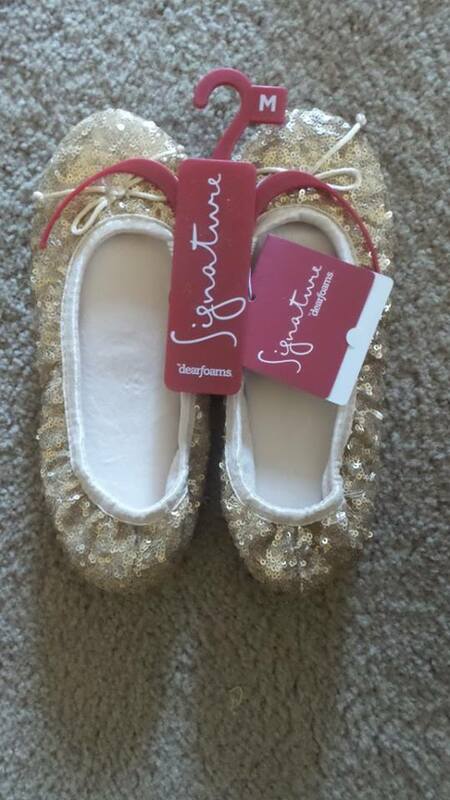 Here is your chance to win a pair of Dearfoam ballerina Slippers and they are sequined!!!! Just because summer is here and many of us a running around with the kids on vacation, day trips and more, doesn’t mean we have to sacrifice the comfort we normally have with shoes. You can tool around town, travel cross-country and still maintain the look of style and the feel of comfort with the summer-time line of Dearfoam slippers available. My personal select is the Sequined Ballerina. With fun prints and styles, such as Espadrilles and ballet flats, you can wear your slippers anywhere the summer takes you. Other fun patterns and styles include the Canvas Espadrille. Available in various sizes and colors to match any perfect summer outfit. Whatever your style of choice, Dearfoam has a wide array of fun, colorful and comfortable shoes available for you. Be sure to check out Dearfoam today and see the selection and sales available. 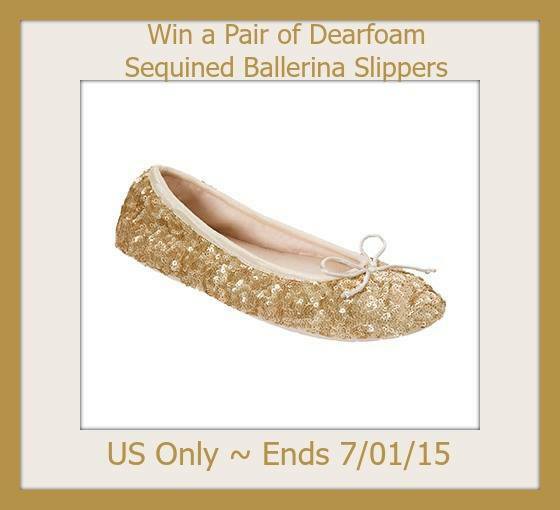 1 winner will receive a pair of Dearfoam Sequined Ballerina Slippers! The giveaway ends on 07/01/15. I really like the Dearfoams Women’s Mixed Material Flat. I like the black Sequined Ballerina slippers! I like the black sparkly ballet flats. The link isn’t working and I couldn’t find a chalet collection. I like the canvas espadrille in splash. I like the mixed material boot in brown. I love the sweater knit clogs! I couldn’t find anything that said “Chalet Collection” but I do love the sequined ballerina slipper and the striped ballerina slipper. I didn’t find anything that said “Chalet Section”. I love the black Sequined Ballerina slippers. I couldn’t find the Chalet Collection, but I love the mixed material boot! the link isnt working, and all i see when I type in chaet on deerfoam is a sweater clog. 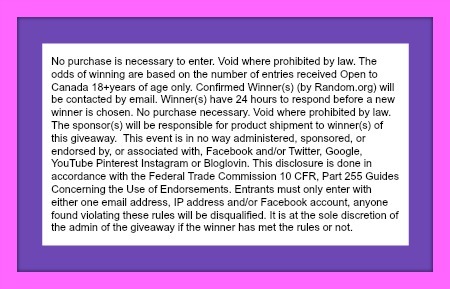 If I won I would like the Microfiber Terry Clog. I like the black sequined ballerina. I like the Canvas Espadrille. They are bright and colorful. I like the purple quilted stripe ballerina. I like the Microfiber Suede Clog. I like the sequined silky boa thong. I also liked the mixed material boots. I LOVE ALL OF THEM! I need to wear flats due to surgery. I like the Sequined Ballerina. I like the velour bootie slippers. These are so tacky. I’m entering for my five year old grand daughter. Do they make them in childrens sizes? I love the look of the “Sweater Knit Clog”., And they all ;ppk so nice and comfortable! Love the microsuede moccasin shoe. I love the Sweater Knit Scuff in Cayenne. Looks so ritzy! I love the mixed material boot,so cute! I have 3 pairs of the boots. They are AWESOME!! I would love to have a pair in Grey Multi. And, yes, I have worn them out in public. And, no, I am not ashamed. I would like the fair isle a-line. I would love the Sweater Knit Scuff for myself! Love how it’s comfy and fashionable! The mixed material boot is so cute!! I love the fair isle a-line! From the Chalet collection I would choose fair isle a-line in grey combo. The microsuede clog with tie look incredibly comfy!